ArtPrize Education Days, presented by PNC Bank, further invests in innovative programs and partnerships for 2016 that integrate National Core Art Standards as well as Integrated Standards in the classroom year-round. GRAND RAPIDS, Michigan (AUGUST 24, 2016) -- ArtPrize, the radically open international art competition decided equally by public vote and expert jury, today announced the launch of program registration for ArtPrize Education Days, presented by PNC Bank—providing programs that integrate the National Core Art Standards as well as Integrated Standards for families, educators, and students of all ages, from early childhood through high school. Concurrently, ArtPrize announced the 2016 ArtPrize Partner Organizations and Schools that host arts education programming during the 19-day event and beyond as well more than $50,000 in grants to partner institutions and educators that help bring 15,000 students to Grand Rapids, Michigan each year. Registration for Education Days programming is now open for schools across the state of Michigan through September 16. Utilizing the 19-day event as an entry point, ArtPrize Education Days provides students with a hands-on contemporary arts experience filled with opportunities to experiment, discover, create, and learn. ArtPrize creates a vibrant community in which children are given the tools to be creative thinkers and problem solvers. Each program is a free 30–90 minute session that includes National Core Arts Standards as well as Integrated Standards ranging from English Language, Arts, and Social Studies to Next Gen Science Standards. Program offerings include guided tours, STEAM activities, artist-led presentations, design challenges, and more—introducing students to the world of contemporary art. Interested educators can begin their Education Days experience by visiting artprize.org/for-educators for program registration and self-guided lesson plans. Additionally, ArtPrize gives Transportation Grants totaling $10,000 to educators, to help offset the cost of bringing a field trip to the annual event. These grants are awarded on a first-come, first-serve basis and we are now accepting applications. These Education Days and Transportation grants are part of a growing ArtPrize granting program totaling over $280,000 in 2016. A new emphasis on STEAM education provides programs for students to explore the intersection of science, technology, arts, engineering, and math to creatively problem solve and incorporate STEAM principles in the classroom. STEAM programming will take place at both the STEAM Village learning lab, powered by Switch, located at HUB/HQ, as well as partner programs including KCAD. Special guest speakers include Albert Yu-Min Lin, an internationally renowned scientist, innovator, technologist, and National Geographic Explorer; as well as Monica Wheat, an inaugural Code.org K–12 Lead and founder of Digerati Girls/Digerati Kids. Education Days is excited to offer new and expanded programming for students of all ages. For high school-age students, these include ArtPrize guided tours led by local teaching artist Eliza Fernand—which will explore public art projects in downtown Grand Rapids as well as socially conscious works of art that attempt to raise awareness and educate about social and political issues. New program partners offer expanded opportunities, including a program provided by the Diatribe, an assembly of spoken word poets, that explores creative writing as an outlet for expression and social change. Additionally, the Creative Youth Center will provide a workshop on graphic stories and self-published literature and the Mosaic Film Experience will offer a film screening that questions the representation of race and gender in film while illustrating the importance of offering different voices within film. New in 2016, the ArtPrize Early Childhood program series will encourage parents and Pre-K students to explore, play, and learn together at ArtPrize Eight. 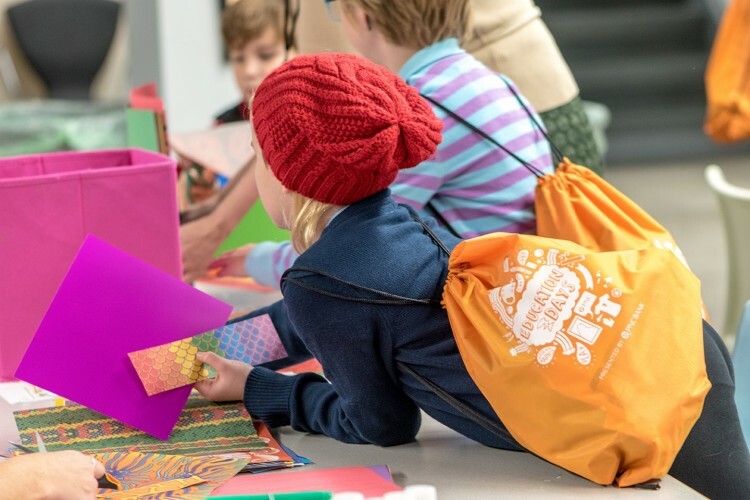 Designed in partnership with Head Start for Kent County, Grand Rapids Public Schools, and Early Learning Neighborhood Collaborative, this series intends to bring over 1,000 early childhood students and their families to ArtPrize Education Days. Programs designed in partnership with schools and districts continue to increase at ArtPrize Eight with ArtPrize Partner Schools. Participating schools model progressive approaches to teaching and learning, and work closely with ArtPrize year-round to design best-practice resources and deepen their students' ArtPrize experience within the classroom. Partners are located within the city of Grand Rapids or serve Grand Rapids youth, and have ​demonstrated a need for increased transportation and program registration support. For a second year, Education Days is partnering with the Cook Arts Center to provide programs for fourth and fifth grade students at Cesar E. Chavez Elementary and Southwest Community Campus. Artists Creating Together (ACT) will provide schools they work with year-round an ArtPrize Education Days experience and Grand Valley State University Charter Schools Office will bring over 2,000 charter school students from across the state of Michigan to experience ArtPrize and participate in Education Days. ArtPrize Eight will once again transform three square miles of downtown Grand Rapids into an open playing field where 1,453 entries at 170 venues will vie for a combination of public vote and juried awards totalling $500,000 in prizes, September 21 to October 9.